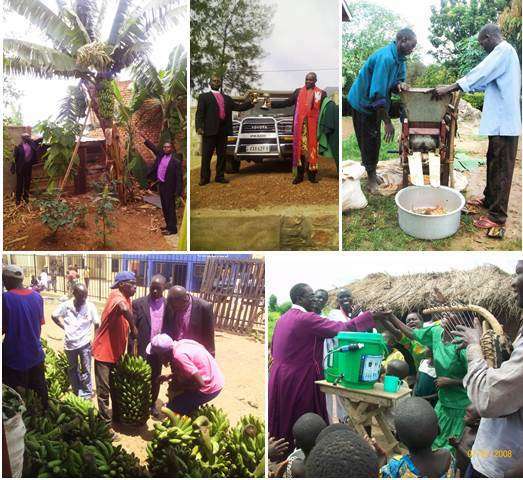 Top Left: Bishop Emmanuel at the their new banana orchard. Bishop Sylvian with donated Vestments and Liturgical wares. Coffee Grinding in Uganda. Selling the Banana in Rwanda. Bishop Gogo setting up cleaning water. NEW YORK, USA — CEC Development seeks to empower local leaders to provide for themselves. First is to deal with the immediate needs of mercy and clean water. We designate 20% of funds from every donation to meet immediate needs and raise funds for clean water to stop the diseases stealing the children’s future. Second is to build for the future. 80% of funds are designated to build for the future by building income producing micro-businesses that will allow the churches in Africa to support themselves, and decide their own future. Lasting Change- Micro Businesses Development project are about the long term change of the culture and environment. To create local income producing businesses that allow the local churches to raise funds to build churches, schools, orphanages, clinics. This allows the future of the churches to no longer be at the dependent on donors. This builds stability into the future of the church in Africa. Recent Project includes a Hostel in Southern Sudan, Cattle Fatten in Kenya and Tanzania, Carpentry and Furniture business in Rwanda and Burundi, A Banana Orchard and Coffee grinding and sales. Please consider supporting these development and mercy projects.